Seminar by Jerry Bergman Ph.D. In this lecture Dr. Bergman talks about his latest book that surpasses attempts by others to expose the evils of Darwinism, Nazism, and racism. Dr. Bergman takes a look at the role that Darwinian evolution played in Hitler's Nazi campaign of genocide. Throughout the highly documented book there is an obvious thread of Darwinian dogma intertwined in the hearts, minds, and practices of the Nazis. Creationists and conservatives often point out the connection of Darwinism to Hitler and his henchmen. Too many times, that logical point is silenced by statements that claim that Hitler was a Christian. Dr. Bergman pounds the final nail into the coffin of any claim of connections between Hitler's ventures and Biblical values. This fascinating program delves into Hitler's eugenics goals; what triggered his anti-Semitic attitudes; his leading scientists; the connection between social Darwinism and government sponsored mass murder; Nazism as applied evolution; the content of Germany's biology textbooks and more. 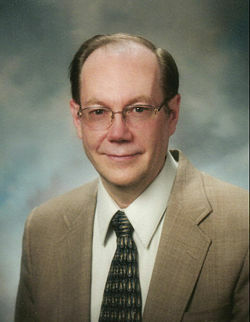 Dr. Gerald R. "Jerry" Bergman is an adjunct associate professor at Medical University of Ohio and an instructor in the Division of Arts & Sciences at Northwest State Community College in Archbold, Ohio. He teaches biochemistry, biology, chemistry and physics. He has taught at the college level for 35 years including 7 years at Bowling Green State University, 6 years at the University of Toledo, and 20 years at Northwest State. He started as a graduate student in biochemistry at Medical College of Ohio in 1985, and was later hired as an adjunct instructor and research associate in the experimental pathology department and he still is still on the faculty at MCO (now named Medical University of Ohio). He has also worked for several years as a therapist at various psychological clinics including Arlington Psychological Associates in Toledo, Ohio.